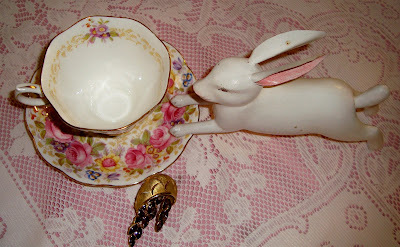 Martha's Favorites: TEA CUPS AND BUNNIES KEEP MULTIPLYING! Hello Ladies! Welcome to Tea Cup Tuesday, No. 107! 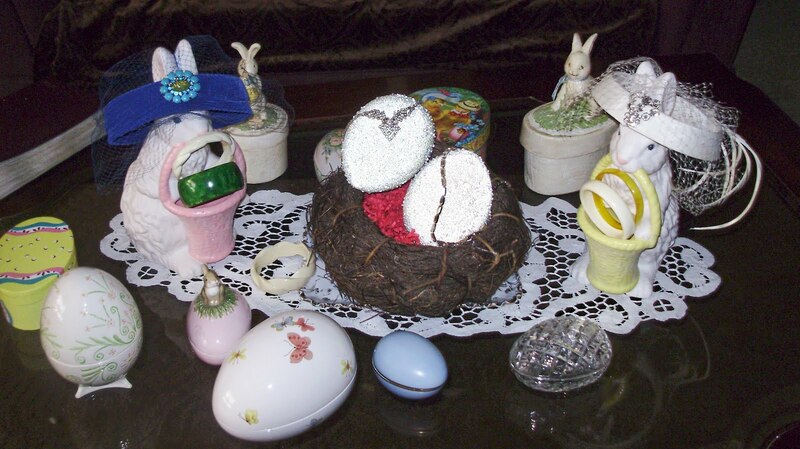 Next week is Easter, and if you are anything like me, we still have to get our Easter Baskets ready. Noah has already asked for a few things in his basket. He is so easy, I could buy him things from the thrift store and he would be excited with that. I had the privilege of babysitting, Sophia alone this week for the first time. She was wonderful for 45 minutes. It was a little ruff after that, to say the least. I told Mom, I would watch her again for 46 minutes. This little granddaughter of mine is a Diva. She likes what she likes and you better figure it out fast. This Grandma has to keep trying harder. Before I start this week's Tea Party, I want to thank you for all faithfulness to my website. I even had a sweet lady want something that she saw from my blog. I love that! I am open for anything. My first tea cup is a German, Hutschenreuther, Richelieu, Pink Roses with gray scrolls and pink roses. To be honest, I don't even remember where I purchased this. That is not a good sign! Cup No. 2 is Royal Albert from England. The pattern name is "Serena" Royal Albert's are so beautiful. Love the pink roses on this one. Cup No. 3 is a Royal Grafton from England. This is a beautiful purple and pink tulip pattern, very cute. 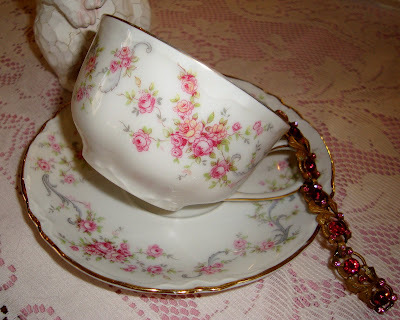 The last cup is a Coalport also from England. The pattern name is "Junetime". The colors are so vivid and they look so Old World. This is a trio, but I forgot to picture the dessert plate. Oh yeah, so many bunnies hopping around your gorgeous teacups...and they have great taste too!! Thank you for hosting lovely lady. As usual I'm loving the lovely teacups you always display, as a dish lover, I'm forever drooling here! HAPPY EASTER to you and yours. All three of your tea cups are so sweet Martha. I love them all, but my favorite today is the Pink Roses! I think I have one very close to yours. You have absolutely stunning teacup collections. These are really gorgeous! I would so love to sip tea with you one day. Who knows maybe it will happen. Until that day, wow, sure is nice to look at all your treasures. Thank you for faithfully sharing them with us all. Have a blessed Easter week. you made me smile with the story about little Sophia. I think 45 minutes are a long time. You did a good job entertaining her for such along time. Noah is like you, he can see the beauty in every thing. 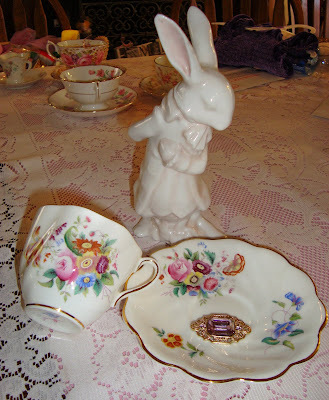 Your tea cups are so sweet and accompanied with the cute bunnies they are nice to see on Easter, too. Thank you for the happy Easter design and have a great Easter time. Your teacups are gorgeous as always, especially the one from Germany with pink roses. Happy Easter to you and blessings for the coming week. You are a wonderful grandma! I'm sure you and Sophia will enjoy many tea parties down the road! Your teacups are lovely! I especially like the first one. It's a very nice match to one of mine today. I hope you have a lovely Easter. Your widdle bunnies are so adorable!! I'm glad that you are keeping your granddaughter every now and then. She will get use to you and never want to leave your side before you know it. It's hard to figure out what the little ones want. But at least you are hanging in there. They are so worth it. Just keep squeezing them, hugging them, and loving them. Before too long she'll be in awe of all of your treasures and your amazing hugs. 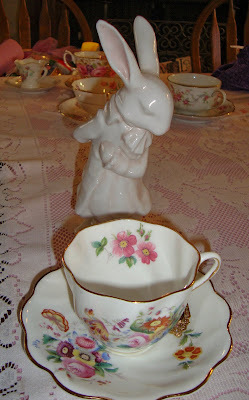 Tea cups and bunnies do seem to clone themselves!!!! Happy Tea Day! You always share so pretty decorations according to each season! And your collection of beautiful tea cups is amazing! No wonder you have been published last week!!! 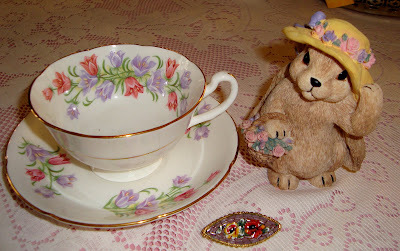 I love that Royal Albert teacup! It is gorgeous! Wishing you a blessed Easter! Thank you for hosting! Wishing you a blessed Easter. Your teacups and bunnies are so beautiful. This is the cutest! Love all those bunnies - gorgeous photos! It great to be back at long last! 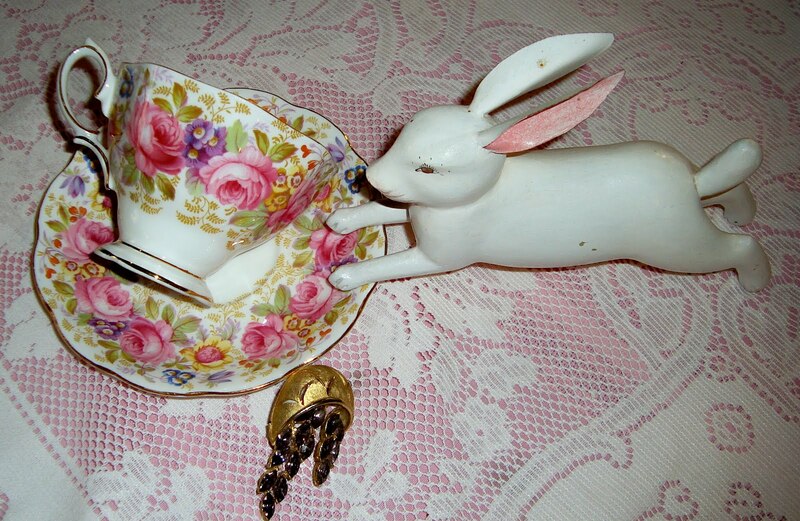 Your Easter bunnies so cute and your fab teacups are adorable and oh-so-pretty as usual. 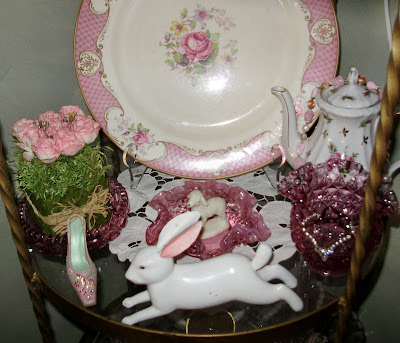 Please,'Hop on over', to have a cuppa in my little corner of blogland and to perhaps also say, 'hello' when you get a moment Martha. I look forward to re-connecting once again dear lady. Your Serena is the best Royal Albert I have seen yet. That is saying a lot. 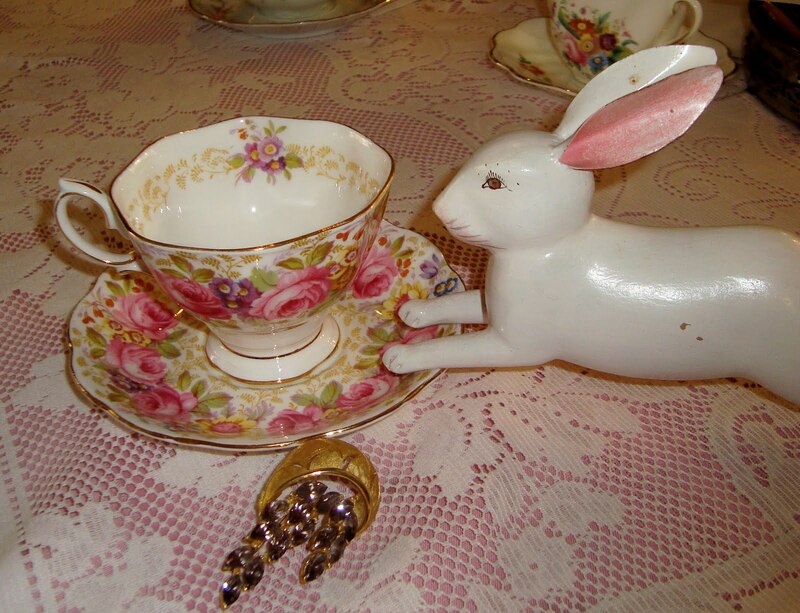 Sweet cups and bunnies, milady! So blessed you have Sandi Patti playing in one of my very favorites! Bless you this Resurrection Weekend!! Love your teacups - especially the shape of the German cup. Oh, and the adorable bunnies too. Enjoy that granddaughter - all of the minutes you can! I agree with Mom Wald. That Serena cup is so gorgeous. Glad to see Wanda Lee is back. Hop over to our blog too. We'd love to see you. Thank you for being so steadfast with your lovely blog and giving us something wonderful to look forward to. 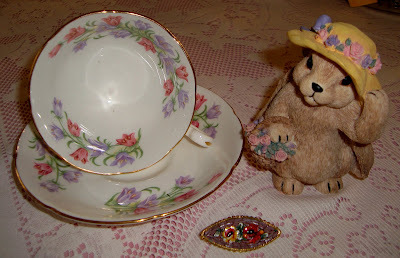 Hi Martha: I'm Connie at http://hotflashncraftn.blogspot.com/, your new GF friend. I would just love it if you stop by and be my friend, too. 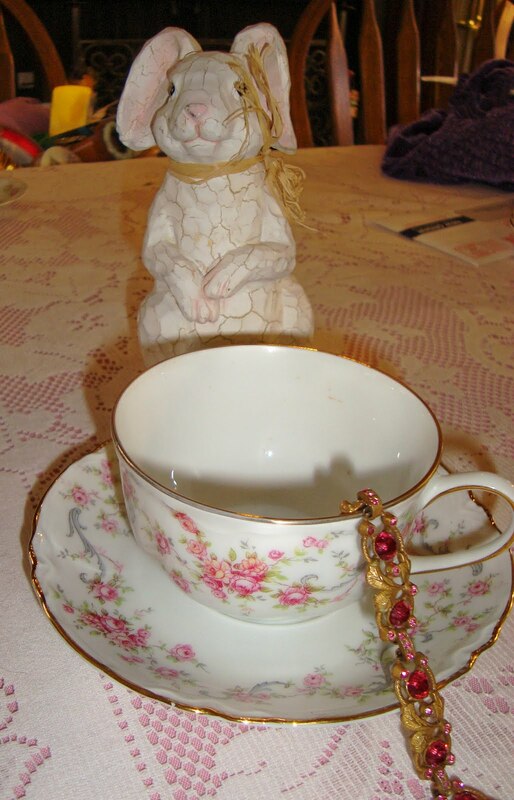 What lovely tea cups you have. Thanks for sharing!